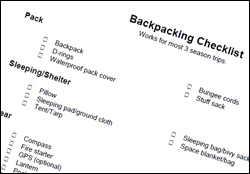 A backpacking checklist is a great tool that saves us time and frustration as we plan our backpacking trips. Unlike your typical vacation, you don’t have the luxury of being able to stop by the store and grab that one piece of gear you forgot. You don’t want to be in the middle of nowhere about to start dinner when you realize you forgot one of your backpacking essentials! The backpacking gear on our checklist is suited for 3-season trips. Many items on our checklist are optional. In the end, what stays on your list depends on what type of trip you are taking and how much you are willing to carry. * Visit our Backpacking First Aid Kit page for a more extensive first aid kit list. When going over the backpacking checklist for your trip, make sure your equipment works and you aren't low on consumable items such as sunscreen, insect repellant, etc. If you are unsure about what to include from the list, do a test run. Pack your backpack with all the things you think you might need. Take a hike to see how you feel. If the pack is cumbersome or too heavy, reevaluate the items you packed.